Attention passengers, the new Stripburger no. 62 finally arrived. Please board now. Our destination: a brave world of new comics! The journey starts with Lars Sjunneson’s (SE/DE) The Demise of the Old World, the fourth chapter of the Åke Jävel story. Whether a regular Stripburger traveller or not, you will for sure enjoy reading a contemplative editorial on this (anti)hero of our times, which was written by the enigmatic Toby Esterhase. We continue our international tour de comics in the company of Peter Lally (UK) and Alex Potts (UK) before stopping in one of Stockholm’s bookstores for afternoon tea with Gunnar Lundkvist (SE), an acclaimed Swedish comics artist. We’re pleased to inform you that the interview is also an announcement of the Slovene release of Gunnar’s comic book, starring his faithful companion Klas Katt, who greets you from the cover of our magazine. 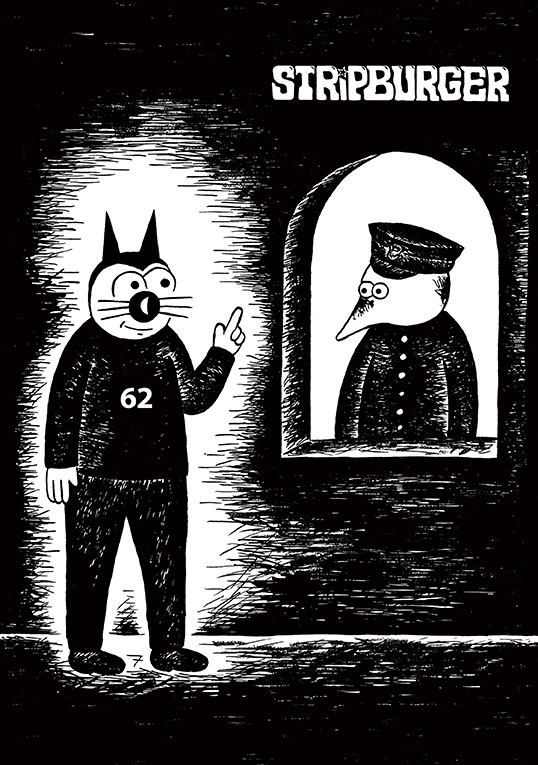 The second extensive interview features a lively discussion with Marcos Farrajota (PT), an indefatigable and enthusiastic agent in the Portuguese underground comix scene. Of course, the interviews wouldn’t be complete without the representative comics by both interviewed artists. The color part of the magazine is occupied by Anna Ehrlemark (SE), a regular fellow traveller on the relation Ljubljana – Stockholm. Appearing for the first time (and let’s hope not the last) are three very intriguing French comics talents: Matieu Z (FR) takes us on an expedition into the dark heart of the Amazon before the creative duo Florent Ruppert & Jerome Mulot (FR) thrill us with an eccentric and provocative comic (both formally and contently), that makes you un-pack your own baggage of what comics are supposed to look like (let along how to read them). Right before the end of the journey you’ll find yourself within the dreams of Laura Teixeira (BR). A bunch of Slovene authors confidently took their places all over the issue. You are invited to a brief excursion into the history of Slovenian comics in a comic by Izar Lunaček (SI).Gašper Rus (SI) and Andrej Štular (SI) present their one-page comic stories and in the third sequel of David Krančan’s (SI) comics expertise Raz Dva Strip you will get to know what speech bubbles are telling us. Finally, as always, for all inquisitive explorers there’s the usual dose of reviews and Stripburger’s comics delicacies. Have a great time exploring and bon voyage!